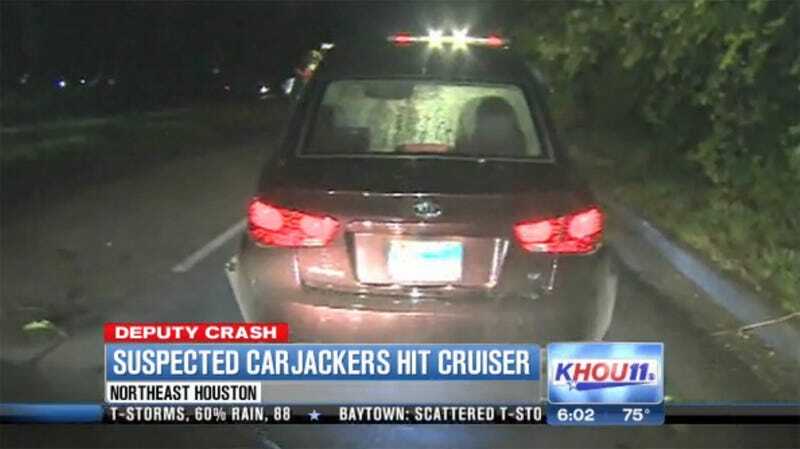 A police chase in Houston early this morning ended when the suspected carjackers crashed into a deputy's patrol car. The chase started when the two suspects driving a stolen car rolled through a stop sign. The chase ended a few blocks away when the suspects cut into a field, spun out, and slid into a deputy's patrol car. KHOU News reports no injuries and no positive ID on the suspects. Here's a Jalopnik top tip: if you're running from the police, try not to crash into a cop car.